February 15, 2018 by JC's Village C.C.M. Day 2's verse like yesterday's looks at the unchangeable loving ways of God. 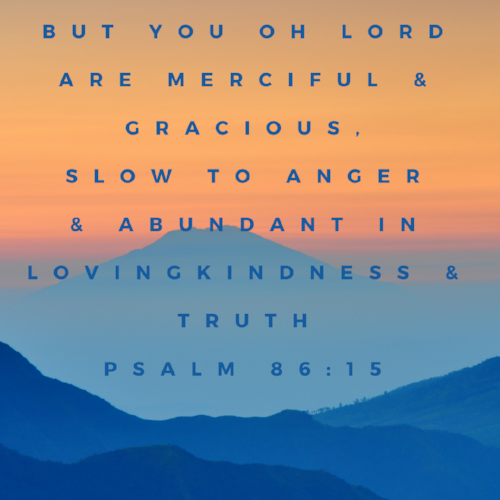 "God was merciful and gracious - slow to anger and abundant in lovingkindness" as the Psalmist says even before the beginning of the universe. Before the existence of time. He cannot be more or less this way today - than He was yesterday - or will be tomorrow. This also means that nothing you can do can make Him love you more or less. He has always loved you as much as He can. If you've been a Christian for a while - this is not new information. But what if it could be a new inspiration? Do you feel like He's merciful? Do you feel His graciousness towards you? At the end of a long day - that went - well - you know - do you ponder Him being blessedly slow to anger AND abundant in lovingkindness? Ever get to sit in a hot tub and soak your aching muscles at the end of an active day? In Jesus' day - people carried around enormous burdens of guilt, misery, despair - and they saw no relief for it. Wherever they looked - they saw brutality. Yet when they heard Jesus speaking and teaching - they flocked to Him. They followed Him for days. Jesus told them plain as day - "my words are my Father's" (John 12:44-46). They acted as if Jesus words - God's words - were as soothing to their souls as a hot tub is to a tired and aching body. I know it can be a challenge - but try to listen to what God's telling you about Himself in this inspired poem written by David so long ago. Go ahead and even read the whole thing if you like. Soak your sore and aching soul in it and rest. Even if you're not so sore - a good soak is good for the soul. February 15, 2018 /JC's Village C.C.M.